TOSS SSC Inter Exams Tatkal Scheme Exam Fee Due Dates 2019: The Candidates who have appeared and failed in the previous year examination are eligible to appear the TOSS SSC and Inter exams schedule from 01-10-2019, but could not pay the examination fee in time, can avail the opportunity of “Tatkal Scheme” may be in March i.e From 22-03-2019 to 28-10-2019 for paying the examination fee. They have to pay the Tatkal fee of Rs. 500/- for SSC and Rs.1000/- for Intermediate and in addition to the normal examination fee. For further details they are requested to contact Coordinator of their respective study centre. 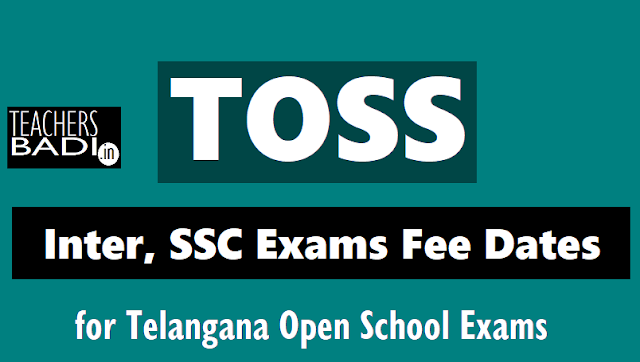 Telangan Open School Society TOSS- Intermediate and SSC (TOSS) Public Examinations, October/April, 2019 - Tatkal Scheme- Payment of examination fee in March 2019 - Due dates, communication of Schedule for submission of Fee Paid List. All the District Educational Officers are aware that the due date for payment of examination fee for Intermediate and SSC (TOSS) Public Examination, April 2019 will be completed in May 2019, for the advantage of the candidates who have not paid the examination fee in time they can avail the ‘Tatkal Scheme’ which is in vogue for the Intermediate and SSC (TOSS) Public Examinations. The candidates who have got admissions into the SSC & Intermediate (TOSS) Course and eligible to appear for the SSC & Intermediate (TOSS) Public Examinations scheduled April / May 2019, but could not pay the examination fee even under the "Tatkal Scheme" due dates from 16.08.2019 to 21.08.2019 is now extended for 5 more days i.e., From 22-03-2019 to 28-10-2019 for paying the examination fee under "Tatkal Scheme". They have to pay the Tatkal fee of Rs. 500 / - for SSC and Rs. l 000 /- for Intermediate in addition to the normal examination fee. For further details they are requested to contact the Coordinator of their respective study centre. The candidates can appear for the Intermediate and SSC Public Examinations, April, 2019 under ‘Tatkal Scheme’ by paying Tatkal fee of Rs.1000/- for Intermediate and 500/- for SSC in addition to the normal examination fee as detailed here under in between may be in March i.e from October, subject to the following conditions. i. The candidates should have got already admitted during the academic year. ii. Failed candidates already appeared for examinations. “Mee Seva” Centers under the concerned AI Code. v. Other than the above candidates, NO FRESH CANDIDATES ARE ALLOWED UNDER TATAKAL SCHEME. The examination fee paid by the not eligible candidates if any shall not be refunded nor allowed to the examinations. vi. Necessary action will be initiated against the AI-Coordinators who sponsor such ineligible candidates under this scheme apart from derecognizing the Accredited Institution. Tatakal Scheme duration Last date for payment of ‘Tatkal’ fee by the candidate In the “Mee Seva Centers Last date for submission of Fee Paid Lists under TATKAL by the AI Coordinator to the DEO. Last date for submission of Fee Paid NR by the DEO to the Head Office. All the AI coordinators are requested to submit the following enclosures in respect of the candidates who paid the examination fee under Tatkal scheme. 2. SSC Xerox copies for Inter. 5. If TOC, original Inter second year failed marks memo to be enclosed. superscribed ’Tatkal’ candidates for SSC (TOSS)/ ’Tatkal’ candidates for Intermediate (TOSS) Public Examinations, March/April, 2019, shall be handed over to the district Educational Officer on the stipulated date. The District Educational Officers are requested to issue necessary instructions accordingly to all the AI Coordinators in their district. Also issue necessary directions to the District Coordinator, TOSS to submit the Tatkal Fee paid List on the stipulated date without any deviation.